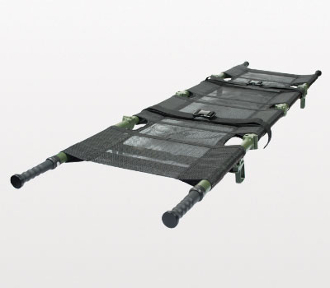 One of most compact & versatile litters on the market, allows casualty transport in restricted compartments. By extending the ergonomically designed handles, the Talon® becomes a standard NATO-compatible evacuation platform. Already the U.S. Marine Corps official battlefield litter, the Talon® is today’s ultimate TACEVAC solution. May show wear from being carried in a truck or assebled for demonstrations/training. Depending on inventory, these may be the older fixed handle versions or the newer colapsing handle version.